Church Elms Farm is a Grade II listed period detached farmhouse with stabling and paddocks set in 2 acres of land on the outskirts of Woodchurch village. 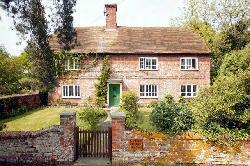 The house is surrounded by a cottage garden and also boasts of an enclosed barbecue area and open fields. The farm has a large pond that is fenced off, also a newly surfaced tennis court and a games room with a pool table and table tennis facilities. The farmhouse is just 4 miles away from Tenterden town centre and 7 miles away from the cinque port of Rye. Ashford town centre is 8 miles away and the mainline station provides a service to London Charing Cross and Victoria, with the International Passenger Terminal providing access to the Eurostar. A large farmhouse with a modern fully fitted kitchen. The old kitchen area is a good place to relax with a large chesterfield sofa and small contemporary dining. Traditional dining room seating 8, sitting room with wood burning stove in a large Inglenook fireplace and a small library area, small conservatory with seating area, shower room. Stairs to first floor: A large landing area with vaulted ceiling, master bedroom with 5' bed and en suite bathroom with hand held shower attachment, double bedroom with 6' zip and link bed which converts to 2 x 3' single beds on request with en suite shower room, double bedroom with 4'6, twin bedroom with 3' beds. Family bathroom with a hand held shower attachment. Stairs to second floor: A large study area with attractive views. Price Code: B during Low season. Price Code B1 during Mid season. Price Code: A during High season.